Deep within the jungles of Mexico and Guatemala and extending into the limestone shelf of the Yucatan peninsula lie the mysterious temples and Mayan pyramids. While Europe was still in the midst of the Dark Ages, these amazing people had mapped the heavens, evolved the only true writing system native to the Americas and were masters of mathematics. They invented the calendars we use today. Without metal tools, beasts of burden or even the wheel they were able to construct vast cities across a huge jungle landscape with an amazing degree of architectural perfection and variety. Their legacy in stone, which has survived in a spectacular fashion at places such as Palenque, Tikal, Tulum, Chichen Itza, Copan and Uxmal, lives on as do the seven million descendants of the classic Maya civilization. The Maya are probably the best-known of the classical civilizations of Mesoamerica. Originating in the Yucatan around 2600 B.C., they rose to prominence around A.D. 250 in present-day southern Mexico, Guatemala, northern Belize and western Honduras. Building on the inherited inventions and ideas of earlier civilizations such as the Olmec, the Maya developed astronomy, calendrical systems and hieroglyphic writing. The Maya were noted as well for elaborate and highly decorated ceremonial architecture, including temple-pyramids, palaces and observatories, all built without metal tools. They were also skilled farmers, clearing large sections of tropical rain forest and, where groundwater was scarce, building sizable underground reservoirs for the storage of rainwater. The Maya were equally skilled as weavers and potters, and cleared routes through jungles and swamps to foster extensive trade networks with distant peoples. The Mayan pyramids of Teotihuacan rise as high as twenty-story buildings,above the central Mexican highlands with a grandeur and mystery that stirs the imagination and inspires the soul. As a civil engineer, I have often been intrigued by the surveying and construction skills of so-called primitive societies; this site is truly exceptional. All of the buildings are aligned with the stars and the solar system from precise survey points in the nearby mountain range, using an advanced understanding of mathematics, geometry and astronomy. Little is known by traditional researchers about the pyramids of Teotihuacan (pronounced tay-oh-tee-wah-con, and simply referred to as "Teo" by the locals). Built bythe Toltecs, Teo was once a city the size of ancient Athens and Rome. It thrived as the primary center of learning and culture in America for over one thousand years, before it was abandoned about fifteen-hundred years ago. According to legend, after the fall of Teotihuacan, two major paths of sacred knowledge formed. 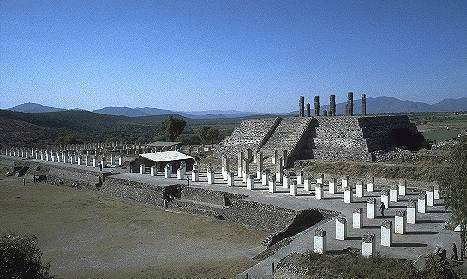 One Toltec path went to Tula near present day Hidalgo. The magic of Tula can be compared to what our culture might term "black magic." The generally more enlightened path called the Path of Freedom went south toward Xochicalco, near present day Cuernavaca, and also eventually went into hiding. The term "Toltec" as used by the Aztecs (who came many years after the Toltecs) meant either a "great wise one" or a native healer or artist who followed a certain tradition; it was not necessarily meant to define a specific ethnic group. In fact there is evidence that Toltec society was a relatively harmonious blend of several of America's early native cultures. The Olmecs and the builders of Monte Alban in Oaxaca, with whom the Toltecs traded, revered the Toltecs and regarded them as the most highly advanced society in religion, magic and art. Yet, unlike the art of other early American societies, Toltec art depicts only two gods: the earth goddess and the rain/sky god. The fact that Toltec art does not prominently portray many gods for worship, supports the belief, common throughout America for over one thousand years, that the Toltecs were able to communicate directly with the gods in the sun, the moon and the stars. In Tula, Mexico: Elevation; 6,500 feet. This sites presents a five-terraced Tlahuizcalpantecuhtli Pyramid. Tula is an ancient Toltec city. 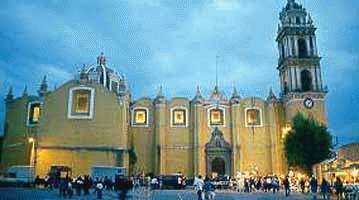 Cholula was the Holy Place of the three major satellite cities of Teotihuacan. 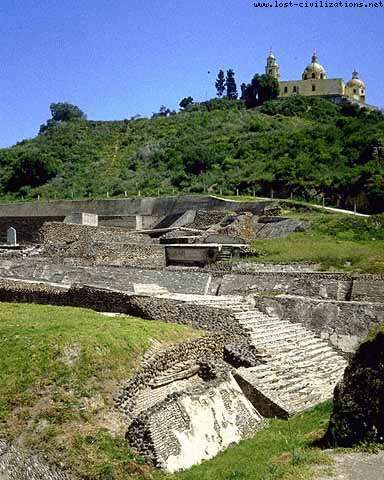 It was destroyed by Cortes and his men on their way to take Tenochtitlan. The pyramid is in the present day city of Cholula and in volume (before destruction) was larger than the Egyptian pyramid of Cheops. After conquest a church was built on top of the ruins. Three successively larger Mayan pyramids were built on top of each other here, and served important ceremonial purposes for the Aztecs. 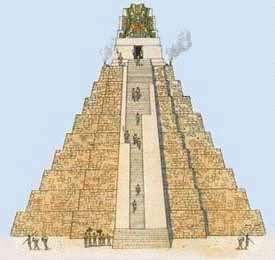 The last and largest pyramid was faced with stucco, which if not maintained turns back to mud. When the pyramid was abandoned, the stucco turned back to mud, and plants and eventually trees grew on it. Historians think the Spaniards were not aware that they were building their church on top of an Aztec pyramid - perhaps they just built there because it was the highest hill in the area! However, it is very common, both in Mexico and in other cultures where belief systems have warred, to see buildings associated with one culture constructed on top of or from the rubble of buildings associated with the other culture. In Izamal, for example, a large cathedral and courtyard are build on top of a lopped-off pyramid. In India, too, one can see mosques constucted from stones whose carvings show that they were originally part of Hindu temples. The great platform, measuring 425 by 250 meters would hold thirty soccer fields. Elevation; 7,000 feet. Site of the longest pyramid in the West (3,100 feet). The name is said to mean "place abundant in hummingbirds", or if properly pronounced to sound like a hummingbird beating its wings. I was told by an old man,what was passed down by his people generation after generation, that mayan people went up the coast north went all the way to what we all know as upper north east of the United States winters to cold they came back and told of all they saw. So that tells me,We where here way before mayflower so we are the founding people of this land. They went not to claim but to discover. This is a pretty good site but it would be better if it was organized. Thanks anyway. hey this is not true you mix all the civilization and the time of them to be honest you don't have any idea what you are talking about. quere chupapar mi pene no se qrea dis information is awsome... keep spreading the love.! Very interesting stuff... thanks for posting this! what do the mayans build the pyramids with? i love you people and Jesus. yal are some good peope. Wow I LOVE this stuff. Would the moderator of this excellent site please remove comments that are rude and/ or off topic? I went to these pyramids three days ago, teotihuacan really is amazing. There is the pyramid of the sun and the pyramid of the moon, pretty darn cool society. Are the pyramids in ruins or as they look in the pictures? I also need to know what the pyramids were made of. I was told that they were made out of the Mayans recycled trash??? I wan't to go, but no one seems to have phone no. the mayas are so kewl. they are like oober kewl. i should so become a mayan. omg. and have like a whole bunch of oober kewl piercings. because piercings rock too. i have a gage and a eyebrow ring. and a belly ring. i also have a whole bunch of peircings on my ears. but those dont count. i would fit rite in with the mayans. im like so in school right now. whoa. 0_0. This was a pretty good website! I have to make a 3-D model of one of these pyramids, and this site helped me a lot! hey, last commentor~ I beg to differ with you- the city at Teotihuacan was not Aztec, (or Mexica). 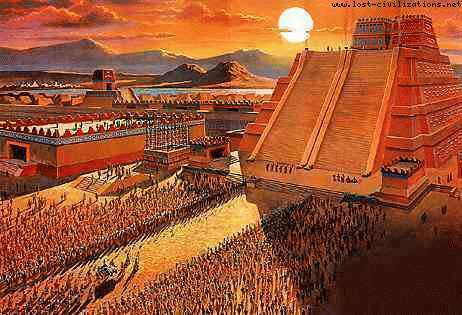 The city was long abandoned before the Mexica people settled in the Valley. The Mexica (or perhaps we could say, "Tenochca"- people of Tenochtitlan) made regular pilgrimages to Teotihuacan, but their belief was that it was built by an earlier race of giants. Or so says my reading and learning. Have another look at the history, if you will. The pyramids are of Aztec architecture not Mayan! There is a big difference. There is a different time line. The Toltecs inhabited the region years before the Aztecs did but the Teotihuacan Pyramids are Aztec. The name "Teotihuacan" is a Mexica(Aztec) name with roots in the Nahuatl language (official Aztec language). I saw these pyramids a few years ago, they were amazing! I would deffinately want to go and see them again! ok im i �� ahren but my eart wouldnt pop up!=( . .
i like this guy named ahren hes awsome hes in my seminar class! This website has pretty good info. Hasta ahorita no se sabe de los constructores de Teotihuacan, esta civilizacion es misteriosa aun. This is [NOT BAD INFO! BUT THE LINKS DONT WORK] SPARTA! shawn salm is so cute!!!!! . great pics...i love shawn salm! I need a guide to travel to mayan pyramids in Mexico, anyone know where I can find one ? I liked the pictures and thought they were pretty cool. I want to go there some day. Also I liked the pictures and thought they were pretty spicey . This website smells really good! Unfortunetly it doesn't tast as good as it smells. y r the colors red n blue? i need wholelot of information about this mayan pyramid in Chichen Itza, mexico. can anyone refer me the site?? i 1ike t0 tyep n t4lk! [] -the bomb has been planted! advice:sleep with itchy bum wake up with stinky finger! Robert and Fabiola, nobody knows who built Teotihuacan, and the Mayans cannot be discarded! 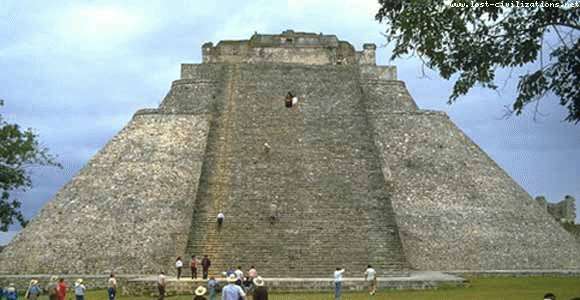 In fact, many scholar believe the Mayans built it and certainly Mayan people occupied it. Teotihuacan did not decline before mayan beginnings but concurrently. The Huastec (Mayans) still live in Mexico very near Teotihuacan. Many believe they abandoned teotihuacan by the marauding ethnic group coming from the north and west. I am not saying Teotihuacan is Mayan, just that it is an hypothesis not to be discarded so hastily. Ya Sabrina I'm crazy about you too! I am so in love with Malisha. These pyramids are absoluetly not Mayan. The Mayans existed in what is now Chiapas, Yucatan, Quitana Roo, Guatamala and also parts of Honduras. The Mayans existed out of influence of the Teotiuacan influence for many years up until about the classic to late classic period when we begin to see influence from Teotihucan. 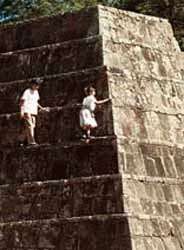 The people from Teotihucan are probably decendents from the Olmec tribes which are found in the states of Veracruz. The Olmec civilization is considered by many to be the mother civilization of all Meso-american tribes. They even invented the Long count calendar before the Mayans although the mayans perfected it. The Aztecs emperoers made yearly trips to Teotihucan to honor the pyramids because they believed they were built by giants in the 4th age. The aztecs believe in 5 ages, we are living in the 5th. Needs more info on your Mayan Pyramids, you dig what I'm tryin' to say. What are the demensions of a general mayan pyramid? Are they are different? How can i make a scale model? when were the first mayan temples builT? hey its me are you there? ok wut is your # bbz! call me 417 376 4315! . omg i love doing gys saying i an a girl it makes me hot hit me up bbz! This website hepled me write a research paper thank you! Great site. Gainin new info 4 my trip 2 mexico. ur not cool "jesus christ"
I apsolutely love the pictures, but can you put more on that are from the mid 1800's or so. Marvellous website , well done. Thank you so much you really helped me on me ss report so, thank you! Those Pyramids in Mexico were HUGE! Teotihuacan IS NOT MAYAN! WAS NOT MAYAN! 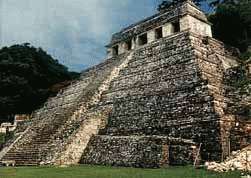 it was abadonned before the rise of the maya and are the oldest ruins of there type on teh continent. They formed part of mayan mithology, because out circle of time, which ends in 2012 began at Teotihuacan, where the last circle ended! I love these mayan pyramids photos, i would like to travel and see it in real! omg someone just type bak to me plz ( this web site helped ) . if someone read the thing above please type back!!! this site was good! . This web site was a great!!!! It let me find the things i couldnt on other web sites Peace CHIKA CHIKA!!!!!!!! This web site is informative as well as educational for those people who do not know much about mexican heritage. well done you all! I'm making a sculture of a mayam pyramid for my history festival! this website is really helpful. Because it talks about an ancient civilization, that could predict the future. I think people should really read more about it. many thanks, chao. I have got what i need adout mayan pyramids. Excellent website! It is remarkable to read about old civilizations. I'm blown away every time I read about the Mayan culture. I was curious after hearing about the possible pyramid find in Bosnia and wondered how the two could possibly be similiar, I guess time will tell. Thank you for having an interesting website one that sparks your interest. Kewl, site bro. i recall those days, and only see it going in the oposite direction now. i like this site alot i love you!! I thought your website was pretty neat, although I would like to know some of the sources you seem to be quoting. I agree with some of the previous comments in that you should make clear where there is speculation. Overall, good website! how r im great your fat hoochy?